If you've been following the weather patterns around the world, you'll know the UK has been suffering a summer heatwave. So, as Murphy's Law compels, when we made a brief visit to London while on an extended stay in France, we had chosen the only day of the sweltering summer when it wasn't sweltering. It was drizzling rain when we arrived, but we were there on a cheap Ryan Air flight and there was no turning back. Once we'd come to grips with the old and not-so-clean state of the London trains and surfaced from the underground ascending about 3500 steps (had no idea we were so far beneath the Earth's surface) to Russell Square, the drizzle had turned into a steady pour. Our original plan had been to walk along the Embankment, admire the bridges over the Thames and have an expensive lunch in a sunny outdoor cafe. That's all. We had visited London a few years before and tried to do too much in one day: Madame Tussaud's, the British Museum, the Tower of London. This time, just a leisurely walk, pleasant al fresco lunch no matter the cost and then maybe more slow walking. A perfect summer's day in London. Well, didn't the rain interfere with that? "Walking the Embankment, not going to work," we said and put up our umbrellas. "Let's go to the British Museum, we'll be dry there and we can spend hours visiting the Egyptian section which we didn't do on our last visit, too busy." Optimism in place we walked the block from the Underground towards the museum's Great Russell St entrance only to be stopped abruptly on the footpath quite a way from it by a long queue of people. 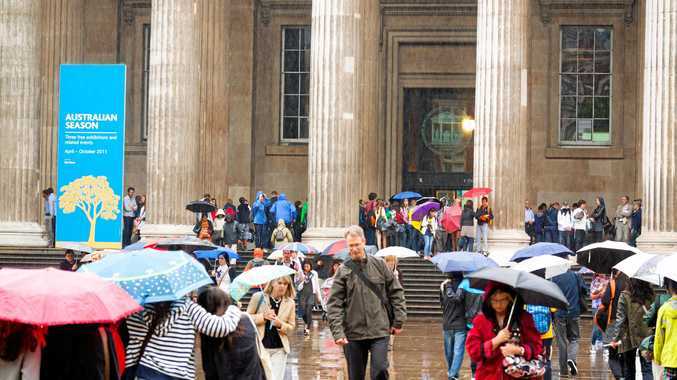 Every visitor to London that day had the same notion as us: get out of the rain and into the British Museum. Just some of the crowds inside The British Museum. Finally, after 45 minutes we got to the imposing entrance of the building with its vast outdoor courtyard and stately columns. "No more people allowed in this entrance," a soggy man in a yellow coat told us. "Too many people. Go around the north entrance. It's just a two-minute walk." Forty-five soaking minutes to be told to go to another entrance. We did as we were told, joined yet another long queue, waited another 45 minutes in the soaking rain wearing sunglasses to avoid having other people's umbrella's poked into our eyes. Finally, after nearly two hours of waiting in the rain, we were in. It was just as wet inside with the floors awash from hundreds of dripping raincoats and umbrellas. We slid and slipped our way up to the Egyptian section with a crush of damp people, stared in fascination at the mummies, looked at archeological finds of jugs, jewellery and artefacts that were thousands of years old - but some of which could work well in a modern house today, and then got out of there and did the only sensible thing to do on a rainy London day, headed to the nearest pub for a pint and pie. 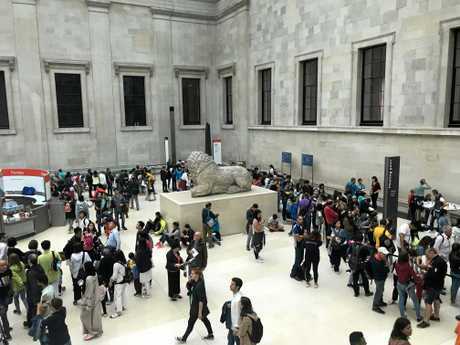 The British Museum has free entry, its collection is as mind-blowing as it is extensive, the exhibits are astounding, the galleries and rooms well laid out and easy to navigate. It's a must-do in London. Allow yourselves a couple of days to explore it. Just don't go on a rainy day.